SoftPlanet makes it possible for everyone to get free Free File Unlocker download directly from our servers. There is no registration needed for downloading. How many times have you received the message - “Windows cannot access this file!”? 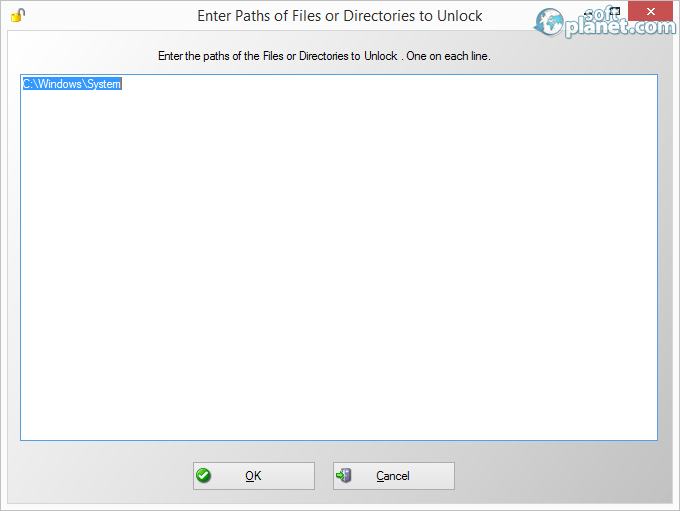 If you want to have access to any of the files on your computer then you can use Free File Unlocker, since the program gives you access to every content that you have on your PC. It even unlocks system files and we attempted it. The app worked without a problem and we can recommend it. This function of the app is very useful if you want to delete files that for any reason have restricted access by Windows. You receive these features for free, because the app itself is free, but if you want you can donate money to the developer. It takes some time to unlock selected files, because the app scans directories for files. But after it completes, then it unlocks files in no time. But Free File Unlocker can also unlock folders, which makes it the master key on your computer. After you unlock your files and directories and finish your tasks with them, you can lock them again with a click of a button. Also you can copy files and directories, delete, rename or move them – functions that expand the usefulness of this program even more. The best side of the interface of the app is that it can be used in many languages, since the list is so long that it takes time even to go through it. The rest of the characteristics of the interface also suggest that it is a user friendly app. Every aspect of this program is with a smooth look, that combines white and gray colors, which gradient from one to the other. The buttons also have pictures which suggest what is for what. Another good side of the interface is that it gives you detailed information about the locked files. Free File Unlocker shows you the name of the file, the process it uses, what the id is, how it is handled, its size, the creation time and when it was accessed. It also offers you info about the last write time and when the file was processed. This makes the interface not only good looking, but also very useful. If you are not satisfied with the way that the app performs its job at the moment you can set it to “Kill Process”, which logs you off your account. But here we had some problems, because when we gave a lot of files to the program for unlocking it crashed and it didn't activate until it finished the process. Actually it didn't finish the process because the system crashed. This is not a case which should cause alarm, because we tried to unlock all the system files, so it's no wonder that everything went black. After that the operating system started without problems, so this is not something that should be added as a bad side of the program. Just be careful what you unlock since this program is very capable. The capabilities of the app are the first thing with which we can praise the app, but it has other features that make it an awesome program. The interface of the app is good looking and it is also multilingual. The app offers enough tools for you to unlock all files and it does it without problems. All of this makes Free File Unlocker the master key for your PC for sure. 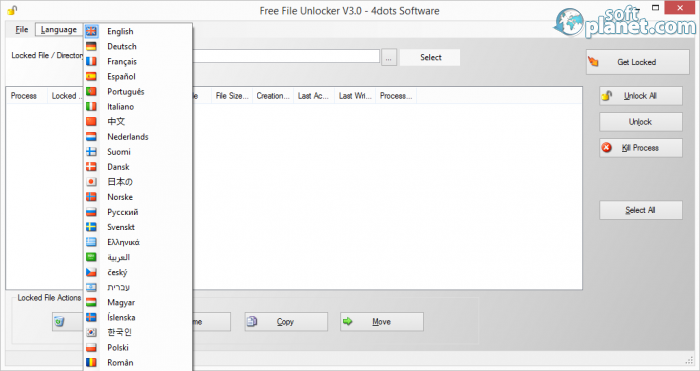 Free File Unlocker is VIRUS-FREE! Our security scan shows that Free File Unlocker is clean from viruses. The current version of Free File Unlocker has been scanned by our system, which contains 46 different anti-virus algorithms. That ensures that Free File Unlocker 3.0.5 is 100% safe for your computer.